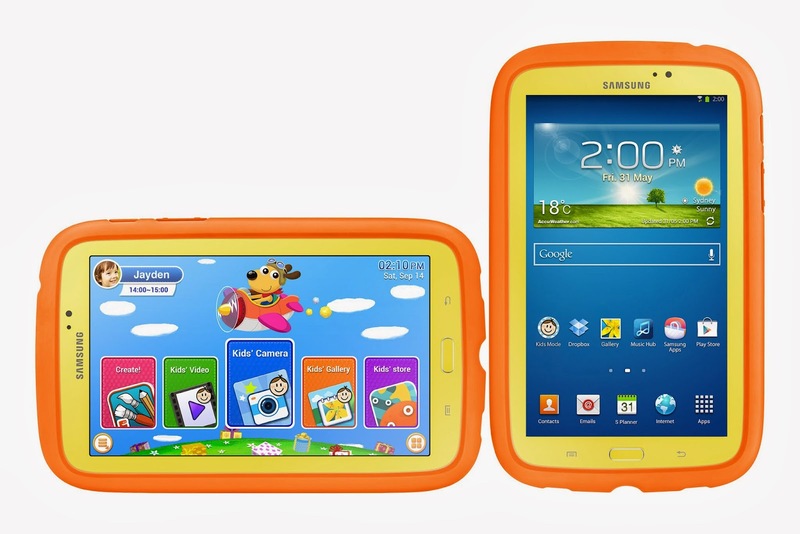 Recently we were sent Samsung's first dedicated tablet for kids, the GALAXY Tab 3 Kids, to trial. In general, I try to limit the electronic or battery operated toys in our house and instead look for toys or materials that are open ended. Most battery operated toys I find are generally unnecessary and have limited purpose or scope for use. When it comes to technology, I understand the benefits, but I also understand the need for parental control. I have seen how easy it is for my daughter to suddenly be on the internet after accidentally pressing something in a free kids app on my phone, and my son can walk by and touch 4 keys on my laptop and suddenly be in a whole different format or program that I’ve never seen before! It’s safe to say that I think parental control and settings for children using technology are needed. The first thing that parents should control when it comes to their child's use of technology, is what they have access to. Children should not have free, unsupervised access to the internet. You know what's out there! We also know that there are plenty of wonderful, educationally beneficial sites, programs and apps available on the internet that are brilliant for kids. The trick is ensuring that your children have access to the right things only. With adult supervision, specific parental control settings may not need to be implemented, but if children are using internet connected technology independently for any period of time, then you should have a way to help you control access to pre-approved content/sites. I found the GALAXY Tab 3 Kids makes this super easy to control, with it's dedicated kids mode for safety and a password protection on anything outside the approved kid friendly apps. The second thing I believe parents need to control, is the amount of time that children are using technology for. It is recommended by the Australian Government Department of Health and the American Academy of Pediatrics that children aged between approx 2-8 should have no more than 1-2 hours of screen time per day. Screen time includes anything that your child is staring fixed at a screen. This means TV, video games, tablets, mobile phones, computers etc. overuse of unstimulating screen time is linked with obesity, sleeping problems, behavioural problems and lower academic performance. I do think that if it is being used for learning purposes, a little extra screen time here and there is ok, so long as children are still getting the recommended time of physical activity each day. We would encourage our children if they were sitting for a certain period reading a book, and reading an ebook needn't be any different, in my opinion. I did love that the GALAXY Tab 3 Kids allows you to set time limits on usage, (from 10 minutes to 1 hour 20 minutes), after which it requires a password to operate. You can even set certain time periods, eg. between 4-5pm, that it can be used, locking it for use at all other times. Very handy features to have. Using it was easy for my daughter (aged 5) and she loved all the apps that came with it. Some of them she had previously used on my smart phone (and was delighted they were there! ), and there were some great new ones there that we enjoyed exploring together. I loved the educational aspects of the books and many of the apps and my daughter just loved the whole interactive nature of it all and how bright and clear the screen and graphics were, compared to almost all of the other kid designated technology we've used. We found that the loading times and screen speeds were also a lot faster than we're used to from kids tablets in the lower price range. I love watching my daughter engaging with appropriate technology. It's just another fun way that we can learn through play. I generally believe in most things in moderation and the use of technology for children is no different. In moderation and with proper parental control, I think that technology can be very beneficial indeed. And, when you have great products like the Samsung GALAXY Tab 3 Kids available, these things just get even easier. A world for kids with an intuitive Kids friendly user interface on the Android platform with a differentiated kids content. 8 best-selling Kids Apps pre-loaded and many more available in the Kids App Store. 20 great free apps in total. Comes with a unique protective and colourful rubber bumper designed to keep the edges of the tablet protected, which can be removed when your child gets older. Overall, to me, this tablet looks, feels and performs like most tablets you’d buy for adults (in this price range). The main difference, (and top feature in my opinion), is it’s dedicated kids platform, which I think has been done really well. I think if you’re after a super sturdy tablet for the kids to crash and bash around on without worry, this probably isn’t the tablet for you. You can buy an additional carry case for it but it’ll set you back another $69.95. My kids prefer using this tablet over the other tougher kid’s tablets, as to them, “it’s like a “real” tablet” and it’s much faster loading than they’re used to. I also prefer it as it’s easy to use (for kids and parents), has all the parental settings I need, good apps and easy access to the Google Play store to put even more free or paid content on it if I like. It’s the kind of tablet that I am happy to let my kids play independently for short periods of time without having to check in constantly to make sure they’ve not pressed something they shouldn’t have. The price is higher than most kids’ tablets but personally I think it’s worth it as I can see us getting a lot of use from this one over the years. How to Win (Australian entries only) *Please note. This competition has ended. 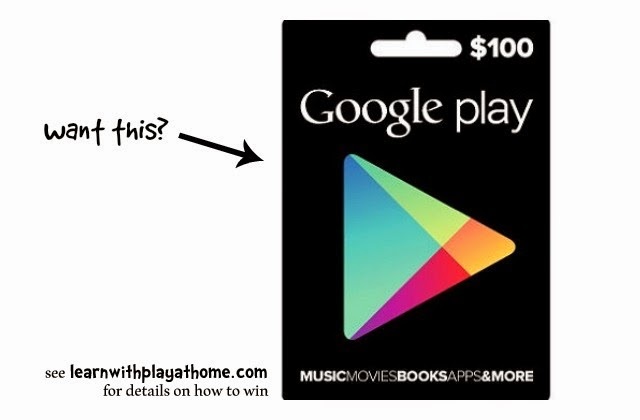 Thanks to Samsung we are giving away a $100 Google Play voucher to one lucky Aussie reader. How would the Galaxy Tab 3 for kids fit into your life? - This is a game of skill and entries will be judged based on creativity and originality. Open to Australian residents only. Entries open 9:01am AEDT,Monday 14th April, 2014 and close 5:00pm AEDT, Friday 25th April, 2014. Terms and Conditions apply. Please click here for full terms and conditions. - If you don't have a profile created that links to an email address then you must leave your email address with the comment. You can't win if we can't contact you! If you use the anonymous profile to comment you need to leave your name and email. There is currently a consumer cash back promotion on offer. 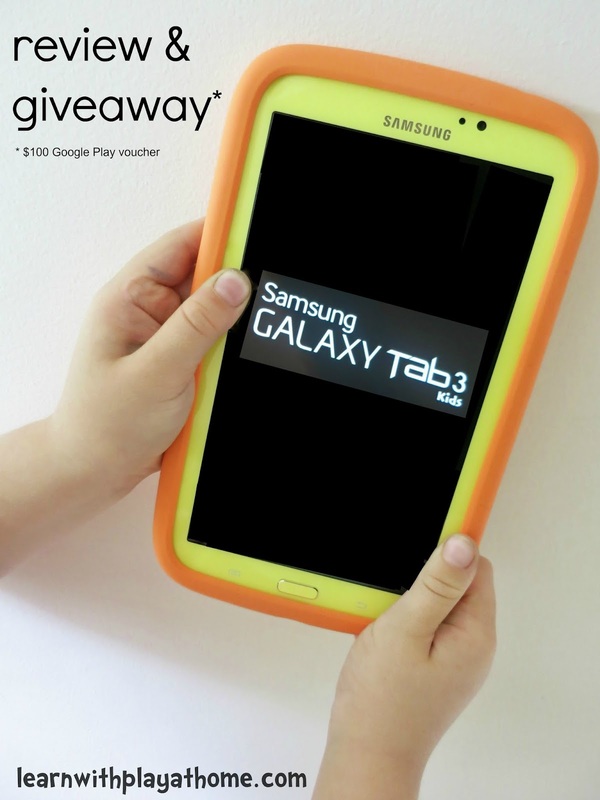 Consumers who purchase a GALAXY Tab 3 Kids tablet between 8.00am AEDT on 27 February and 6.00pm AEST 30 April 2014, can get $50 cash back. Terms and conditions apply, visit www.samsung.com/au/promotions for full T&Cs. Oh my goodness, this looks absolutely fantastic! I value technology and understand there needs to be a clear balance between screen time and general play. I think the timing feature is fabulous and would work very well within our family. It could be used as a little technology station within our home. I'm totally with you on the need for parental controls when it comes to technology. I think Samsung have caught onto a genuine need in the market, and I applaud them for doing something about it. Now, with my Samsung Galaxay 3 Kids, my kids can play within safer boundaries - and I didn't need to research and acquire tech guru skills to set up those safe boundaries. 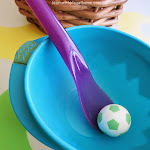 I love the idea that it incorporates learning about animals, numbers and colours with play. Just like hidden vegetables in dinner the kids are consuming something good for them without even being aware. It would a real advantage for preparing and boosting knowledge in the pre-kinder year. As a parent we want the best for our children and the Samsung Galaxay 3 kids tablet certainly would help make this possible. I think that this is the perfect middle ground between having control over screen time for your children and teaching them that they need to practice moderation as well. The Samsung Galaxy Tab 3 timing function is fabulous for that! Technology and handheld devices are great opportunities for learning and teaching kids to use them responsibly as they grow up is invaluable! This would be perfect to hone into some motor skills and test her wits with guessing games. It can boost her knowledge, skills and still have fun at the same time. Playing games and learning seems to work really well in her memorizing and picking up so much. The Galaxy Tab 3 would be perfect for my homeschooling girls! It would be great to use the Galaxy Tab 3 as a re-enforcement tool for lessons. I can switch it between my two girls. One can be playing educational games while I work with the other one. Great addition for lesson! Such a lovely review! I feel similarly about technology for children as you. My kiddos are just learning about technology and I love to find fun ways for them to understand educational concepts. My older son would love to have some time when little brother naps on the weekends, so we can explore it together. I would use it to help my son learn his numbers and alphabet. The Galaxy Tab 3 fit fabulously into my family's life! 3. My 3 year old has speech problems and Ioves playing on the i-phone. Playing games on the Galaxy would be a great reward and incentive for him to remember to pronounce words properly. 4. And for me - a Galaxy would fit into my life by reducing stress levels. With it's protective casing, I could relax about my boys bumping the tablet. A Galaxy tab 3 would make my son go YIPEE! He wears an eye patch each day, the tablet would help this pain go away. The apps are fun, and educational for my son, and mummy can have a rest, knowing the Galaxy tab 3 is the best! The Galaxy Tab 3 would be perfect my three children. 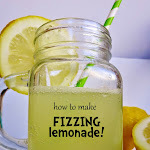 I am very impressed with the fact that it caters to the different ages of my children and could be used by each of them independently (with parental supervision of course). It is rare to find a product like this that is so versatile. Really appreciated this review thanks Deb. I have been searching for a way to incorporate technology into my twins learning experiences as well as for the family day care children but I haven't been happy with the slow loading times of the other child specific models we currently have or the screen resolution. I also don't want kids all sitting up in front of the computer as it is a lot harder to control when there is just one of me! The features you mentioned about setting up times, locks etc sound fantastic and really well thought out. I'm yet to use apps on my phone for the kids would you believe (yes i know you would!) so i'd love to win the google play voucher to give some of these apps a try. Now I just need to find the money to purchase the Galaxy tab 3 too! 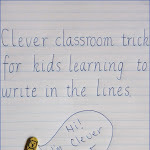 I use tablets as a teacher of young children and they are an amazing learning tool. There is almost nothing that my kids couldn't learn with a Samsung Galaxy Tab 3! We'd love one at home for play and learning. My girls love playing on my Samsung Galaxy Note phone. So it would be awesome for them to have the Galaxy tablet to use instead. Their favourite app on the phone is Sketchbook for Galaxy, a great open ended drawing app, love seeing their creations. I say this in all seriousness: This is exactly what I’ve been looking for! Samsung Galaxy Tab 3 would fit perfectly into our lives for the following reasons: 1. Five year old and 3 year old are thirsting for more educational and imaginative stimulation. 2. I have limited technology so far as I am wary of overloading their exposure to screen time – so the time controls in this product appeal! 3. We’re a Samsung family already (our phones) and I love what I know. And 4. We’re about to go on an overseas holiday and I’ve been looking for something just like this to entertain the kids on the flights. IDEAL! My 16 month old son already loves to play with many apps on our smart phones. I have had several scares where he has clicked on the wrong part of the screen and accessed an external site and even once he managed to answer a call for me, and this is all while I am sitting right next to him keeping an eagle eye on him. I would love to be able to give him these 5-10 minutes of enjoyment without these worries, and the Samsung Galaxy Tab Kids fits the bill like no other product I have seen. I would also love for him to be able go grow up understanding how to safely and comfortably use technology. Who knows what technology they will have when he is in school, and I want to give him the best start I can. My family is also Samsung all the way. We have phones, tablets and even our TV from Samsung. Definitely our most trusted brand. This looks great!, My son loves playing with my phone or tablet, but its has always been a time when I have to keep an even more watchful eye out as he is a drool machine and my current devices wouldn't stand up to that very well, with a device that is designed for toddler torture it would alleviate these problems. He is already learning a lot about todays technology and i'm sure that something like this would help him to get a headstart on his learning. It will defentily be a great way to entertain them on car trips to and from school, we moved recently and it takes between 30 and 40 minutes to get them to school on a good day if there are no delays. Some days the car trips become very stressful, would love this to keep them occupied, and me calm. I would use the Galaxy Tab 3 as a screen time option. 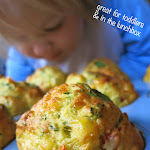 I often let my preschooler have some of her screen time while my toddler is napping on non-preschool days. It gives her some calm time to break up her day, and it also means she can use up her allotted screen time while the toddler is not also watching. I think she would enjoy being able to choose between the television and a kids tablet, especially with the variety of apps available these days. I like the parental controls - as she is getting older and more capable, this is becoming more and more important. I also like the idea of being able to keep my phone away from sticky fingers. I think the Galaxy Tab 3 would be a great match for both my 5yo and even my 2yo! So many great family friendly options. Love it! Tablets were made for when kids have to wait... waiting at appointments, waiting while siblings do after school activities, waiting while adults do adult things. This is how we most often use tablets or devices at our house and I am forever grateful for the invention!